Norman K. Ahrendsen, 89, of Olin, passed away Tuesday, September 1 at the Anamosa Care Center. He passed without pain and in peace to go join his wife and son. Visitation was Tuesday, September 8, 2015 from 4:00 – 7:00 p.m. at Lahey Funeral Home in Olin. Services were Wednesday, September 9, 2015 at 10:30 a.m. at the funeral home in Olin. Burial followed at Olin Cemetery. 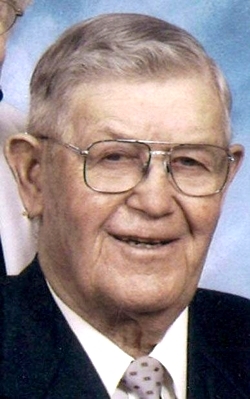 Norman was born in rural Olin March 7, 1926 to August Ahrendsen and Irma (Nissen) Ahrendsen, joining two older brothers and a younger one to follow. He attended Hale Country School until 7th grade when he entered Olin School and met “the love of his life,” his wife Marge. He was active in sports, excelling in baseball, a game he loved all his life. As a young man he played with the Wyoming team for a number of years. When he and Marge married they lived on a farm east of Olin, near the farm where he was born. He worked hard, milking a few cows those early years and raising cattle and hogs. His love of Black Angus was always his priority. He and Marge would jump into their old truck and check the cattle daily, whether calving or not. The couple had three children, Sheryl, Dennis and Jim. Dennis was involved in 4-H and showed the Grand Champion steer at the Jones County Fair in 1963 which was a particular source of pride to Norm. He also loved golfing and won a “hole-in-one” trophy for his effort. In later years they moved into Olin where he enjoyed morning coffee with the guys, sharing farm, weather and local news. He continued mowing his lawn, caring for Marge who was disabled with arthritis, and various other activities. He belonged to the Masonic Lodge in Olin, was a past Master and was active as long as physically able. He also belonged to the Methodist Church in Olin which he and Marg attended regularly when health allowed. In 2010 after hip surgery, it became impossible for them to manage independently. They moved to the Anamosa Care Center where Norm enjoyed the social activities and watching TV in their room with Marge. When she passed away in July 2013, he was lonely and wanted to be with her after sixty-nine years of marriage. On September 1st his wish was granted. Surviving are his children, Sheryl (John) Knodle of Marion and Jim (Dawn) Ahrendsen of Anamosa as well as six grandchildren: Tim, Todd, Tracy, Terry Wood, Kyle Ahrendsen and London Sadler; two step-grandchilden Marcus Knodle and Pam Razor; six great-grandchildren: Lane Ruley, Spencer and Danielle Davis-Wood, Andrew and Kiah Wood, Jackson Razor. Also surviving are two brothers: Lowell and Gayle, two sisters-in-law Wanda and Pauline; numerous cousins, nieces and nephews. Preceding him in death were his wife, Marge, son Dennis, brother Merlin, parents and parents-in-law. He was a dear man who will be missed by those who loved him.